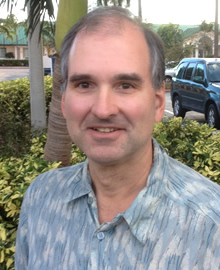 Welcome to the official website of author and Get It Now Music recording artist Gary Charles Metz ! Gary devised his own common-sense method for weight loss, dropping 42 pounds in 84 days by doing what his book title says: Eating what he wanted, Shrinking his appetite, and Walking . To share his success story with others, he wrote The Eat What You Want Diet, aka The Shrwalk(R) (Shrink and Walk(R) Diet) How I Lost 42 Pounds in 84 Days By Shrinking My Appetite and Walking. The ebook is now available for 99 cents via major e-tailers. Interested print publishers can Contact Gary . Also a talented singer and songwriter, Gary wrote all 16 songs on Dare To Be Kind , his eclectic country-pop flavored offering, which includes the timeless new classics Every Day Should Be Mother's Day , Thank You, A Road You've Walked Before (Cocoa Puffs), and Dare To Be Kind. To give the songs a listen, click on Music Samples. To learn about upcoming events and projects, be sure to add your name to the Mailing List . 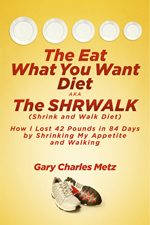 To purchase The Eat What You Want Diet, aka The Shrwalk(R) (Shrink and Walk(R) Diet) How I Lost 42 Pounds in 84 Days By Shrinking My Appetite and Walking, click on the e-tailer of your choice. Good Shrwalking(R) to you! Copyright 2001 Gary Charles Metz All Rights Reserved. Site by Internet Presence Consulting, Inc.